It is unfair that where you happen to be born matters so much to your potential success in life. Warren Buffet has said that he won the "ovarian lottery" by being born in the United States — had he been born into a poor village in Peru, he says, his "talents" probably would have gotten him nowhere. "Lottery" is the right word: luck alone determined Buffet's place of birth. The process of globalization has leveled the playing field a bit and reduced the relative advantage of being born in a rich country. Information and knowledge and physical goods now flow to the poorest corners of the earth. Over the last 50 years, with the rise of free trade and emergence of technologies like the internet, we've seen an extraordinary reduction of poverty. Hundreds of millions of people, mostly in Asia, now live above the poverty line. But there is still work to be done, of course. Every night, in 2009, over a billion people in the world go to bed hungry. And just because someone isn't ultra-poor, doesn't mean he has the same opportunities or access as someone born in the United States. So how do we make further progress toward the ideal of all people of the earth starting the race at the same point? Here's an answer you won't hear from guys like Peter Singer or Jeffrey Sachs: immigration. Or, to continue the globalization idea: more globalization, though a globalization that includes the free movement of people, not just goods and ideas. The champion of this cause is the economist Michael Clemens. I recently met Michael at a conference in Miami and witnessed his presentation on migration issues. He began his talk with a moral question: why is it that a guy who happened to be born in the U.S. can do a certain job and get paid more than 300x that of a guy born in Haiti who's doing the exact same job, working equally hard, equally industrious. Why shouldn't the Haitian have the opportunity to move to the U.S. and receive the higher wage? We don't allow discrimination based on the choice-less facts of race or gender — why do we on place of birth? He went on to debunk various myths: such as the idea that increased legal or illegal immigration depress U.S. worker wages or that the so-called "brain drain" hurts the countries exporting their people to richer places. In one jaw-dropping slide he showed a chart showing unemployment in the U.S. being inversely correlated with total immigration. Here's Will Wilkinson in praise of the "intellectual rigor" of Clemens' work. Here's Jeff Jacoby on why conservatives have it wrong in their outrage over illegal immigration. Here's another Jacoby piece that Lou Dobbs should read. 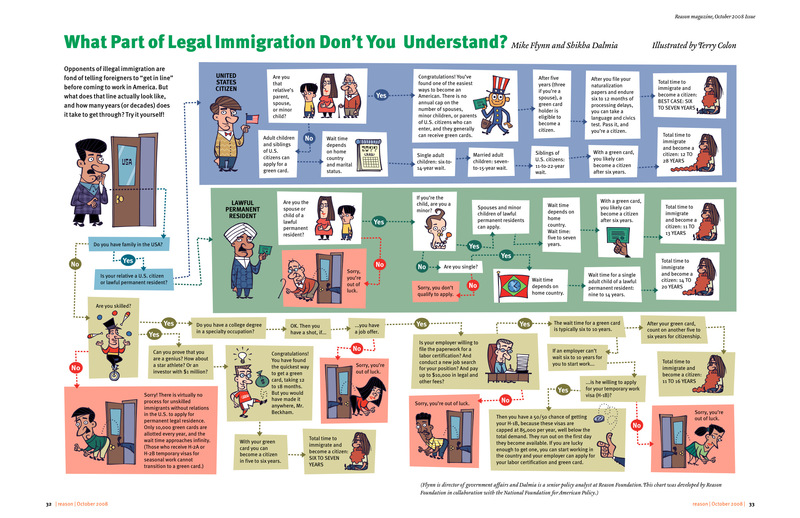 Here's an extremely simple, easy to understand chart that explains how the immigration system works in America. 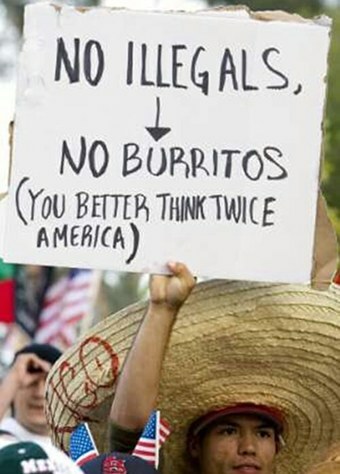 Here's a photo that should convince any foodie to think twice before protesting against immigration. Bottom Line: Immigration is one of the best anti-poverty solutions. We need to reform immigration policy to make it easier for (non-terrorist, healthy) people to enter the U.S. Hail Michael Clemens' work on this topic. I’m curious why you felt the need to include the (healthy) caveat at the end of your post. Whether someone is healthy or not is also likely part of the ovarian lottery. For the same reasons I believe other people should have access to markets, I believe they should have access to health care. If, as I suspect, you wish not to pay for that person’s illness, the root of the problem would seem to lie in the way we handle health care, not the way we handle immigrants. Maybe you’ve made the caveat preemptively, assuming we are more likely to open our borders than we are to reform our mandatory health care laws, but I still find this interesting, and I think it highlights the inherent duplicity of the “universal healthcare” debate. James, I wouldn’t claim to be an expert on this issue, but it’s important to recognize that “universal healthcare” is not the same as “universal-within-a-particular-country healthcare” when people are free to move about. Real universal healthcare has no adverse selection problem, whereas the latter case does. Unlike in previous immigration waves, this one is lower skilled, less educated, and more crime prone. Why? Because previous generations required great moxie to get here–crossing the ocean. Now, nothing more is required than to hide in the bottom of a truck for 20 minutes to cross from Tijuana to San Diego. Also, unlike previous waves, so many arrive illegally–consciously choosing to break our immigration laws and often to then immediately get false ID so they can steal welfare and other services. So it’s no surprise that this cohort has a high crime rate (New studies support that, debunking previous ideologically biased ones), are overwhelming the schools, the criminal justice system, health care system, and are a core reason states like California are essentially bankrupt. So, while certainly being born in the US versus Zimbabwe is winning an ovarian lottery, the costs of paying off the losers in that lottery are huge, not only to legal Americans but to the world. If America must spend on illegals, the resources it otherwise would have invested, for example, in medical research and other innovation and on aid to developing countries, the U.S. will become just another large “developing” nation, able to do little to abet the plight of the world’s billions of losers in the ovarian lottery. What surprises me is the contradiction in the kind of free market ideology supported by many Republicans who are in favor of the free movement of capital, but disfavor the free movement of people. It’s logically contradictory to argue for free markets while arguing against the free movement of labor. Makes no sense. Unless you introduce ideas of race, culture, and integration that is, in which case it makes a kind of horrible racist sense. This is what Democrats seem to abhor, without understanding that they are supporting free markets when they support immigration, which then contradicts some of what they support. I wish both sides would be clearer about what they support and why, but preciseness in politicians’ speech seems a difficult thing to come by. I also completely agree with your point about equality of opportunity (I assume this is what you mean by the idea of ‘randomly being born in one place and not being able to earn what others earn with your level of effort’ (paraphrasing)) – we have this strange localist idea that equality of opportunity should be a domestic, rather than international, moral goal. That’s a mirage. The moral imperative is towards equality of opportunity for all people, to provide them a frame within which they exercise their agency to exert effort or not. Ok enough now. Apologies for length of comment. Great post Ben. Nobody who opposes immigration has the right to call themselves supporters of the free market. Great point. I'm not sure how I feel about this, upon further reflection. This is a very, very interesting topic. Great post Ben. I am not sure it’s intentional, yet the title to this post reeks of typical american hypocrisy – projecting immigration (or whatever US does say, Iraq war to exhume non-existent WMD etc.etc. )as a panacea to global poverty (or freedom) when in fact overseas brains and labor is the need of the hour for the US to dig itself out of its current socio-economic mess. As for the ovarian lottery, is it just for Americans? Ask any native spanish, Italian or Indian – all of them feel the same way in their own countries. Who wants to pay $200k for a bypass surgery if I can do it for $2000 in India where I can get the same if not better quality of surgeon and where success rates are far greater. Recognize that it takes the average legal immigrant almost a decade before he or she can qualify to vote and carry a US passport. The INS is one of the most inefficient of the federal agencies. It puts even legal, immigrants through a fairly shameful process – it’s US version of “hazing” the newcomers. As for the illegal aliens from Mexico or Haiti, we have read many of them die crossing across one of the worst deserts in the world or the turbulent seas in a leaky boat after having paid their guides (“coyotes”) their life savings. And they come here because American farmers, restaurants and others *need* them. It’s easy to say let’s build up the Mexican economy – there is a thriving maquiladora economy already across the border. Some jobs have to be done locally. While I am not advocating open doors policy for illegal/militant aliens, I would certainly stress that it’s not as if every one is dying to get to the US. John Doerr, the legendary Kleiner Perkins VC has commented that “we should be stapling a green card to the diploma” of advanced science and engineering degrees earned by foreign students. America should fix its own mess first; for which it needs brains from all around. It had better admit it before it becomes the onus of the world to fix American poverty -a badly mangled ovarian lottery. Or shall we call it Ovarian snafu ! So it doesn’t take “moxie” to get to the US illegally? That must be why around 500 people have been dying every year in the desert between Mexico and the US — because illegal immigration is so *easy*! All of the myths you confidently repeat have been studied in depth and found to be false. Lee, Ronald, and Timothy Miller. 2000. “Immigration, Social Security, and Broader Fiscal Impacts.” American Economic Review 90(2): 350–54. It’s easy to have uninformed opinions. And why would Americans ever take time and effort to inform themselves about the truth when it comes to immigration policy? After all, we Americans will never bear the consequences; we are utterly unaccountable for these policies. While an interesting idea for the short-term, the reason it is overlooked is because it is not the long-term or full-scale solution. What, are 5.7 billion people going to immigrate to the US? The better point remains to export know-how and rule of law to the rest of the world, not pretend they could all live here in the geographical confines of the US. This also dramatically underestimates the question as to whether the American lifestyle is sustainable, both in the environmental sense and the personal sense. Cultures have ridden off the rails before. Either inviting everyone here or globalizing our exact way of life (which is still different from exporting certain ways of doing things *into* existing cultures) may not be the best plan. Can you direct me to that “jaw-dropping” chart? This is a very strange comment. America might have a "socio-economic mess"
but it's not even close to the dire poverty that billions in the world face. America benefits from immigrants; the immigrants benefit more. Ben- while I am a big fan of immigration as the real life blood of this country, the inherent problem is not one of a sperm or ovarian lottery. The problem is clearly laid out in Tom Friedman’s latest book, a hot, flat, crowded, etc. Ben we can’t afford for the too many people in the world to be American. Whether being American means living here in America or living the American lifestyle in their own country, the world does not have the resources to support it. That being said, lottery or not, the world is not fair (unfortunately). We have to figure out how to let as many people the world over live at an American level of consumption, while leveraging that to continue an American advantage and make the world a greener, friendlier place. Sound impossible? That is your mission if you choose to accept it! Can't find it right away but I'm sure Clemens has it somewhere on his site. to deny a higher standard of living to someone who lost the ovarian lottery. I used the word poverty in a relative sense – poverty of ideas to fix the mess. Get your facts right Ben. Who told you the immigrants benefit more? Whom did you verify it with? Ask a Michael Dell or a Bill Gates that visit India thrice a year to set up their own R&D centers here since your government does not allow them to hire enough talent. Their corporations will fold up if the supply of talent is left to political discretion. he can send money home. Isn't it obvious? High skilled immigration more clearly benefits the U.S. AND the immigrant. the US, and succeeding, he is a very rich man, and so is the U.S.
1) Life isn’t fair, and never will be (simple but true, as unfortunate as it is). 3) Immigration shouldn’t mean open boarders with no security. I think most peopel would agree we should welcome hard working, active members of society. What we have today does today does not accomplish this in any way shape or form. I would have loved to give up this by agreeing to disagree. Yet your otherwise clear vision is somehow blurred on this count. Perhaps your facts aren’t in place. You say [The US economic]mess is a far smaller mess than third world poverty ? You’ve forgotten the fact that the entire US economy is built on surplus parked by other global economies with it. US never had a surplus since second world war, that’s when (Europe was badly mauled) it began rejecting gold standard and printing currency at will (that’s where the stimulus $$ came from). It’s that basic paradigm, the assiduously built illusion of the financial powerhouse that US never was, that got badly shaken with the current meltdown and both Fed and its masters have no idea how to fix it. US strength has been its people, its open door policies and rewarding merit. With that gone, it’s future is anybody’s guess. Take a look at latest US Balance sheet, it will be poorer than the poorest nation in the world – with liabilities far outweighing assets !!! You cannot look at a country's balance sheet as if it were an individual's. rewarding merit. All three things still exist. are still very, very rich in global terms, economic recession or not. Krishna – Immigrants from Latin America send more money home than foreign aid is received by those countries (link to news.bbc.co.uk). If these immigrants are able to live here, pay the price for goods and services of living here, AND send money home to other family members, that’s a closed case. Immigrants benefit enormously. You got me wrong I guess. What I said was the *US economic mess* is no worse than global poverty, third world or elsewhere. Elsewhere poor people go to sleep without food but in the US the entire economy is wiped out giving a whole new meaning to the expression “It’s a flat world”. Banks folding up by the dozen, Detroit losing its Auto hub identity – and how long will it take before people go to bed without food? I certainly don’t relish that prospect, but that seems very, very likely, no matter how absurd it sounds now. And if American underfunded social security and healthcare system is not fixed (hardly any solutions in sight), soon you’ll have poverty levels comparable to elsewhere in the world, if that’s what you are trying hard to cover up. Hence US needs all the help that it can get from everywhere and the reason why it’s important to keep its doors open – it’s principal strength that made it a great hub of innovation and a magnet for talent. Immigration was the topic we were on and my primary objection was US needs immigrants more than immigrants need US. It does all the more now. I don’t think the quantum of foreign aid a country gets is a comparable metric to the inflow of non-resident dollars. It’s because foreign aid is not a constant source of revenue, it’s occasional and gratuitous by nature. During times of crisis, those countries will have a larger inflow far in excess of remittances from its people working overseas. Latin America has been in crisis since late eighties, going to the extent of being pawned off to World Bank and IMF (hyper inflation like Zimbabwe has now). Your other point – if you say immigrants get paid more in the US, they are also taxed more and they are also made to spend more on food, healthcare, housing etc. And even as they are not entitled to the same benefits as another US citizen paying identical amount in taxes, resulting in a clear addition to American GDP or alternatively subsidizing the US citizen. Hence my point US is at a position of advantage vis-a-vis its immigrants but project as if it’s only the other way. reporting on the U.S. economy…. your final conclusion is incorrect. Hooray for Michael Clemens’ takedown of the racist assumptions so enthusiastically touted by Marty Nemko. I eagerly look forward to the day that US citizens of Mexicano descent outnumber the other mongrels (need I say there is no such thing as racial purity) and out-vote them on issues like immigration policy. A certain historic balance will be achieved when the descendants of the original inhabitants of the western hemisphere assume the reins of power in the most powerful nation of its two continents, which have been raped by Western Europeans and their descendants for five hundred years. The US citizenry needs to accept that their big party is over, and that present US levels of consumption are not sustainable. The earth’s resources are finite and cannot sustain US levels of gross over-consumption of energy per capita, resource depletion, environmental degradation and reduced ecological health. I can hear the world laughing at Kevin Cassidy’s fantastic notion of the US exporting “rule of law to the rest of the world”, after eight years of the Bush/Cheney cabal giving the international rule of law and the treaties of the Third and Fourth Geneva Conventions a big finger. An economy that’s built out of debt and the paper has no market now. No two way quotes available for restoring liquidity. A currency that depreciates its way out of existence backed up by the main street economy that struggles to preserve its margins either by outsourcing or by hiring cost-effective immigrant labor that anti-immigration policies have sworn to wreck. How long before the pack of cards collapse? It would be subject to national security concerns as well, but you included (non-terrorist and “healthy”) at the end. I really enjoyed this post and I feel like it will prove to be quite predictive in the upcoming decades. But how do you think people will reconcile the two issues I mentioned? Hope you had a fantastic Thanksgiving, Ben! Ted, but why do the concepts of national sovereignty and citizenship matter? We continue to disagree. I think when we say “does the US benefit more from immigrant labor than the immigrant benefits from living in the US?”, it is a difficult thing to measure. How does one measure the benefits of rule-of-law? Name any Latin American country over the last 30 years where the chance of death or injury or severe illness (especially considering civil war) has not been significantly higher than in the US. That’s a benefit immigrants received that is very hard to quantify. The basic payoff of a life saved is that it has another opportunity to put itself into a life-threatening situation. The economics of it become exponentially higher, and more difficult to measure. I do like the article you connected to, though. I don’t think that’s representative of Indian medical care, but it does give us great hope for the future in all countries. I agree, you don’t want to get into a citation war. The works I cited, pointing out that immigrants do not disproportionately raise violent crime nor burden public coffers, are written by respected academics at top universities and published in leading peer-reviewed academic journals. They are worthy of Ben Casnocha’s readers’ time. All citations are not the same. That said, the mere fact that a statistic appears on the CIS website does not necessarily render it false. So let’s look at the information on the CIS page you cite about immigrant crime. The CIS page then asserts that there is “overwhelming evidence” that the census data underlying this study are simply incorrect, and points to a footnote that provides exactly zero evidence that there is anything wrong with the census data. Second, the CIS page notes ominously that “The Federal Bureau of Prisons reports that 26.4 percent of inmates in federal prisons are non-U.S. citizens. Non-citizens are 8.6 percent of the nation’s adult population. However, federal prisons are not representative of prisons generally or local jails.” In other words, immigrants are overrepresented in federal prisons. Federal prisons only hold about 8 percent of the country’s total inmates, and in state and local prisons immigrants are greatly underrepresented. Putting these together, it turns out that for incarcerations as a whole, immigrants are *underrepresented*. The reason they are overrepresented in federal prisons is closely related to the fact that most immigration violations are federal offenses. So this statistic about federal prisons is utterly meaningless about immigrants’ inherent criminality. And CIS admits as much in the third sentence of the quotation above, but that doesn’t stop them for quoting the statistic anyway. Third, the CIS page takes results it doesn’t like — such as two papers’ finding that the number of incarcerated immigrants fell even as the immigrant stock rose — and boldly asserts that the results are “wild and implausible”, based on zero evidence. Fourth, the CIS page misleads its readers. It warns, “From 1998 to 2007, 816,000 criminal aliens were removed from the United States because of a criminal charge or conviction”. USCIS agrees, in its July 2009 “Immigration Enforcement Actions: Annual Report”, that “criminals” accounted for 27% of removals from the US in 2008. What is the definition of “criminal” here? About a fifth of them the crime committed was an “immigration violation”. It is either a stupid oversight or deliberately misleading to include “immigration violations” in any reasonable definition of immigrants’ criminality. Note also that over 1/3 of the “criminal removals” in 2008 were for drug violations — not violent crime, not property crime, not preying on poor helpless American natives, but simply working to supply America’s voracious, unchecked demand for drugs. If you demand marijuana in California you suffer little or no legal sanction; if you supply marijuana to California you get kicked out of the country. CIS is gleeful about that; I think it’s horribly unjust. These and other reasons are why no one as intelligent as yourself should take CIS seriously. To its credit, the CIS page does admit that “[m]ost studies comparing crime rates and immigration levels across cities show no clear correlation between the immigrant share of a city’s population and its level of crime”, and that there is “no relationship between violent crime and immigrant share of the population” in the country as a whole. This evidence is starkly incompatible with your claim that immigrants raise criminality. But as I said before, what possible incentive could you or any other American citizen have to become accurately informed about the consequences of forceful restrictions on international movement? We will never have to bear those consequences ourselves, so we are free to engage in fantasies with impunity, and read flimsy websites that confirm out prejudices, rather than put in the time and effort to acquire credible facts. The idea is that much of the foundation of our social interaction is based on nationalism. you destroy the concept of citizenship and nationalistic DUTY. So why does this matter? As an example, I’m pretty nationalistic: I care about poverty in America, but why? Because my relatives have actually settled in the states, etc. I can’t say whether they would have done so with completely open immigration, but I can say that had there been such open immigration, my relatives would have just been another group of trade workers, who come and go, who make some good money then leave. So I guess it’s not so much that nationalism and citizenship themselves matters,but rather the duty associated with them. Without such feelings of duty, America loses its place as a substantive, morally meaningful community. It just becomes a place to make money. What are your thoughts on this? How does a country with open immigration maintain a sense of duty, or something that produces equal results? (4)…interstellar travel (to the third world)… and all the films made with a ferocius, malign and subliminally infectious contents about the past, present and future, inciting them from those movies veiledly to violence…WHAT TO SEE IT´S WHAT TO DO…because that is how control them… CREATING PERIODICALLY ARTIFICIAL ECONOMIC CRISES AND WARS…so that the People could never live too well and peoples have no choice but to obey… VIOLENCE, POVERTY, RELIGION AND IGNORANCE… Like all Intelligent species have built their civilization from initial ignorance, but still have not realized that and NO more lies, if they want to continue climbing has already been for steps Justice, Truth and Science. Unable to brake overpopulation of unique and contaminated planet who still have… we hear in the news: “in 50 years there will be no fish in the sea”…”sea level is rising”…”a possible glaciation”…”unrelenting growth temperatures”…and stay so calm…never stop pouring million Tm/year contamination to the foul air, they are almost suffocating in cities…and blame to the Anticyclone… It seems that they will not be able to go beyond of their technological adolescence and out of the way of extinction, guided by ignorant leaders. After seen this…we had better go away to find another planet very far from the Evil Empire: religion, armies, monarchies and politicians… Goodbye Earth.